Do you ever just want to escape? Freshen your point of view? Seasonal changes seem to inspire these types of things. As much as I would love to live on vacation 24/7, I know that is merely a dream. 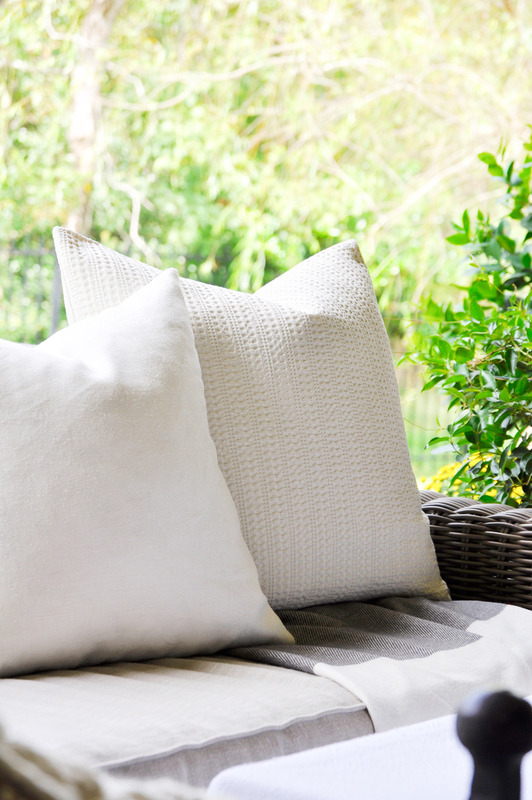 What is a reality is being able to transform your back patio, or front porch, into the serene relaxing space it beckons to be. As you know, I thoroughly enjoy incorporating my own style into the season. 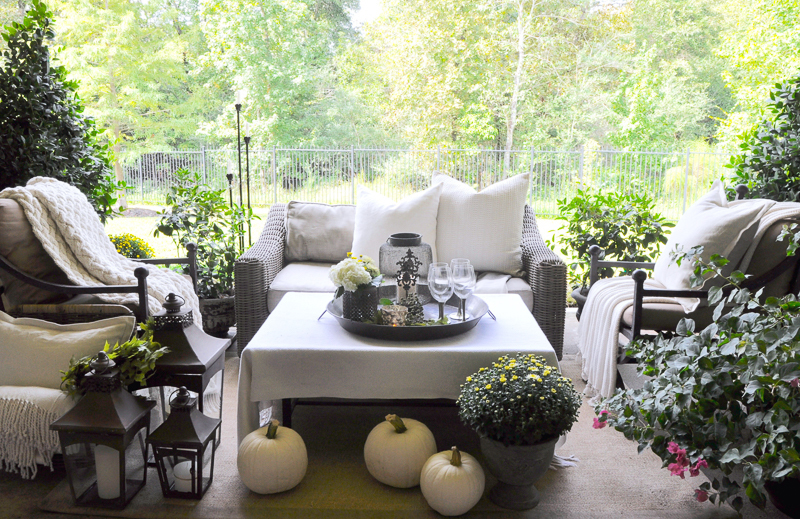 Since fall is here, I felt it would be nice to illustrate how the decor of the season would feel right at home in the outdoors. 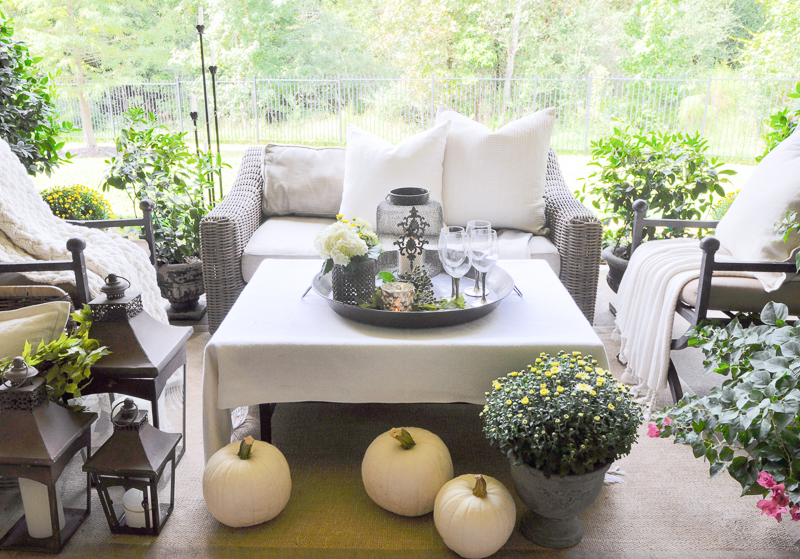 Welcome to my back patio….. 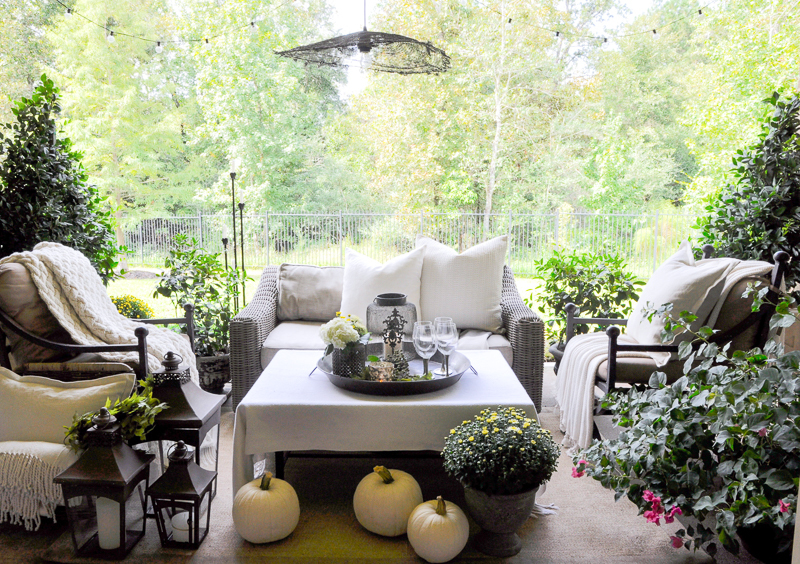 While enjoying the outdoor space, I personally want to feel the season that is upon us. 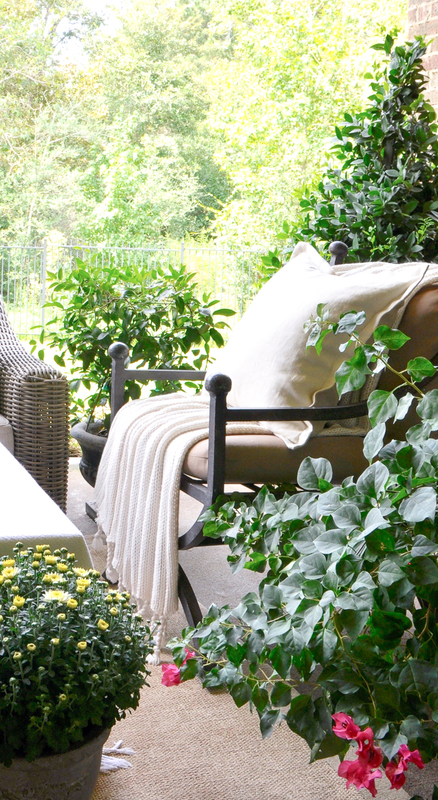 After I climb out of bed and fix myself a hot tea, I venture outside to our back patio. 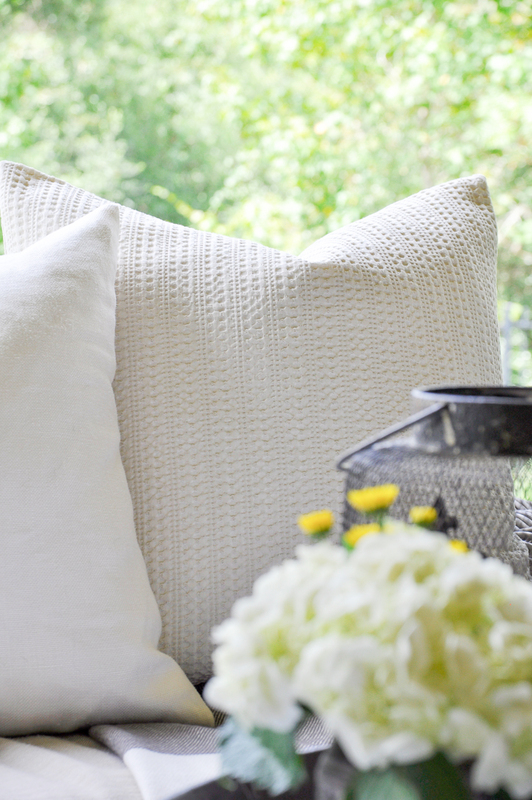 Here, I can curl up with at least one pup and take in the crisp, cool fall air and gather my thoughts for the day. 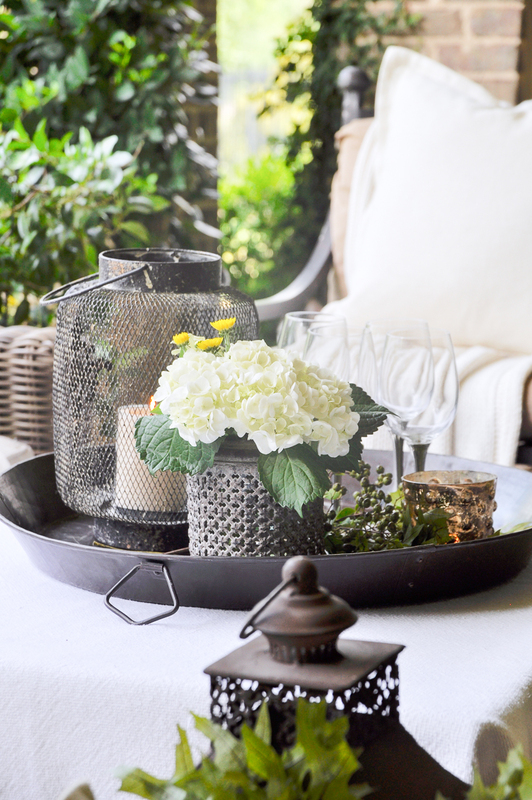 It’s also a perfect evening spot for a glass of wine or for dinner as you may have read about in my recent Tips for Hosting a Perfect Dinner Party. 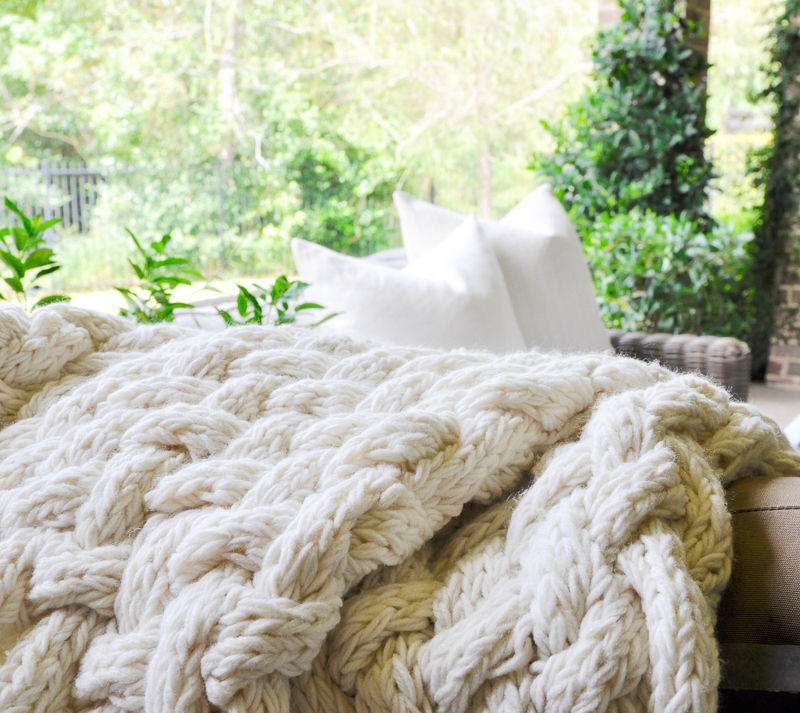 The cable knit throw softens the space while adding texture simultaneously. Plus, it keeps me warm (and I’m always cold, so this is a good thing). 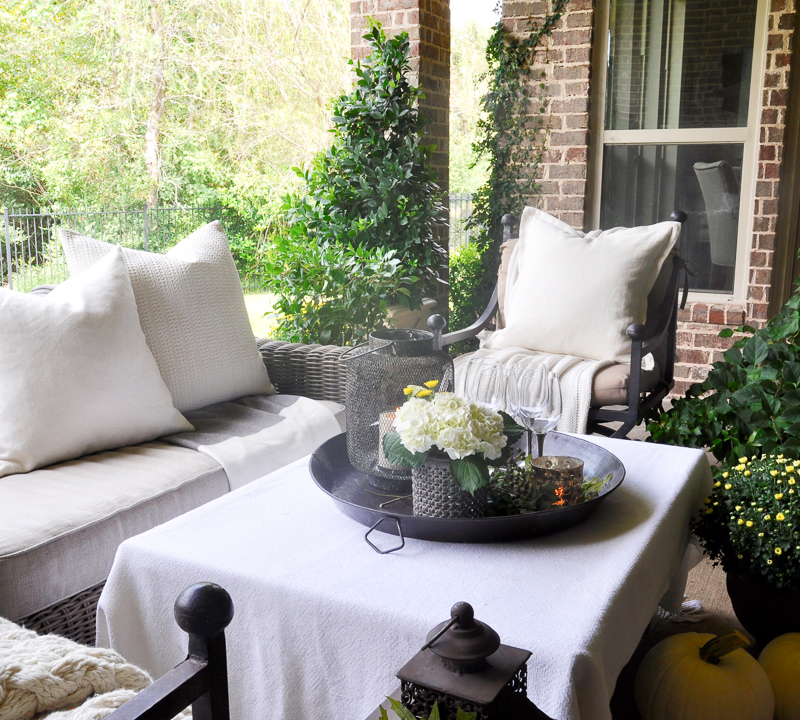 My patio is covered, so I am able to use some of the same throws and pillows out here when the weather is mild. 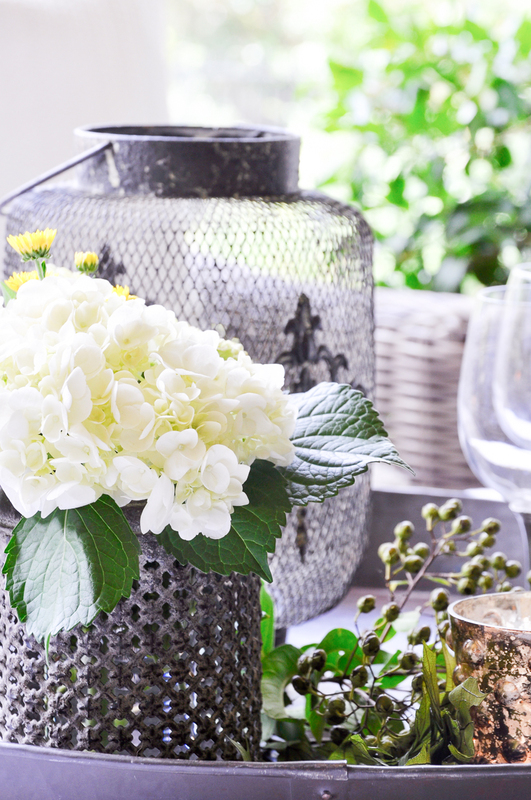 A few subtle pops of floral color provide depth against the more demure palate of whites and creams. 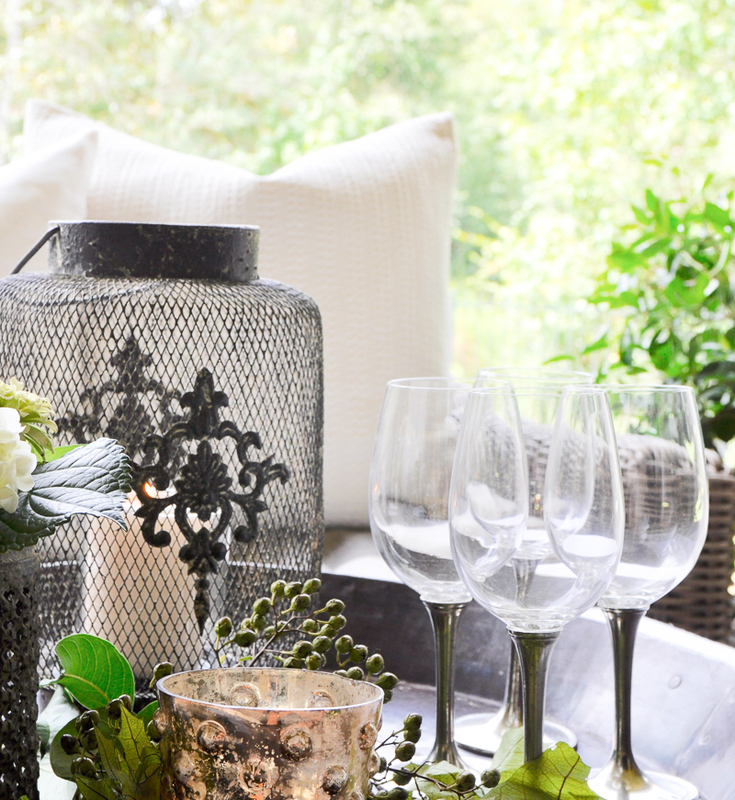 Lanterns are so versatile that I use them all over our home. They work fixed atop a table as well as on the floor here. 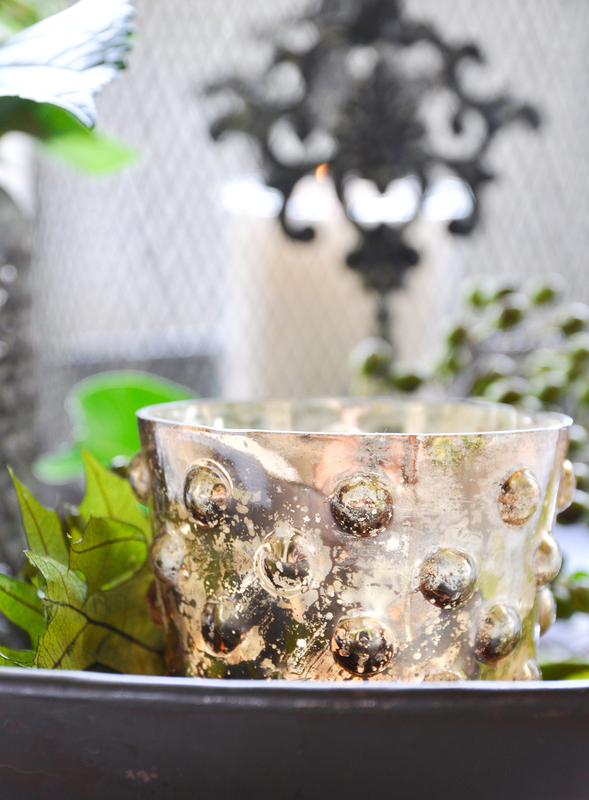 I love to light the candles in the evening. 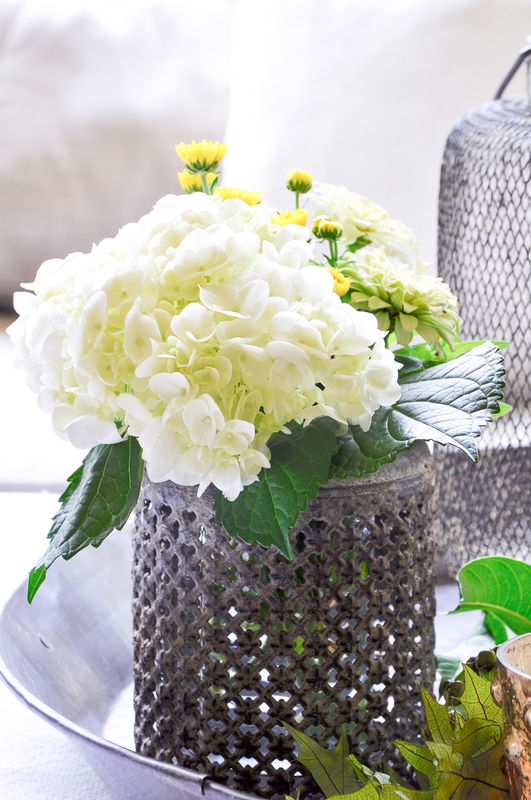 Tabletop accessories complete the look. 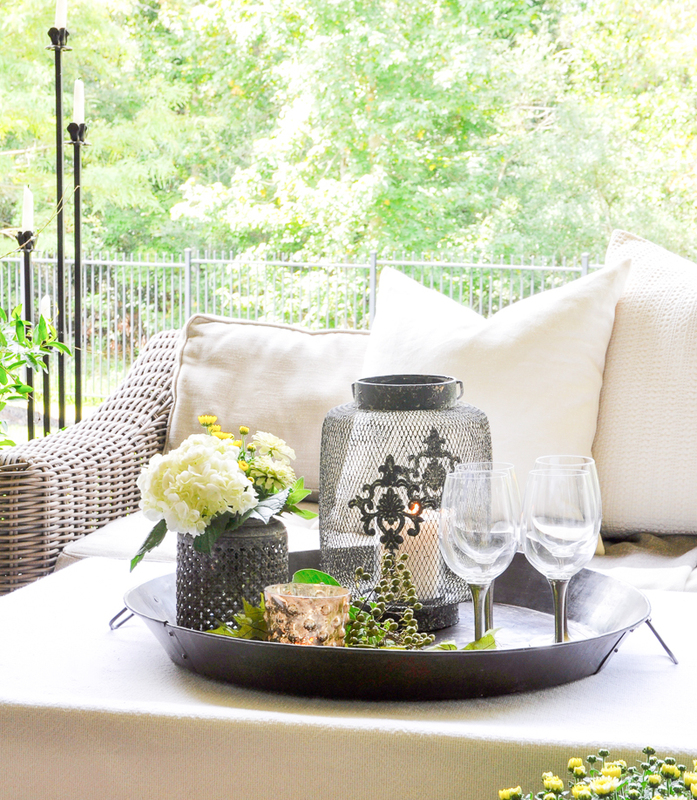 My top three components to the perfect outdoor coffee table tray? Candlelight, flowers and beverage glasses. 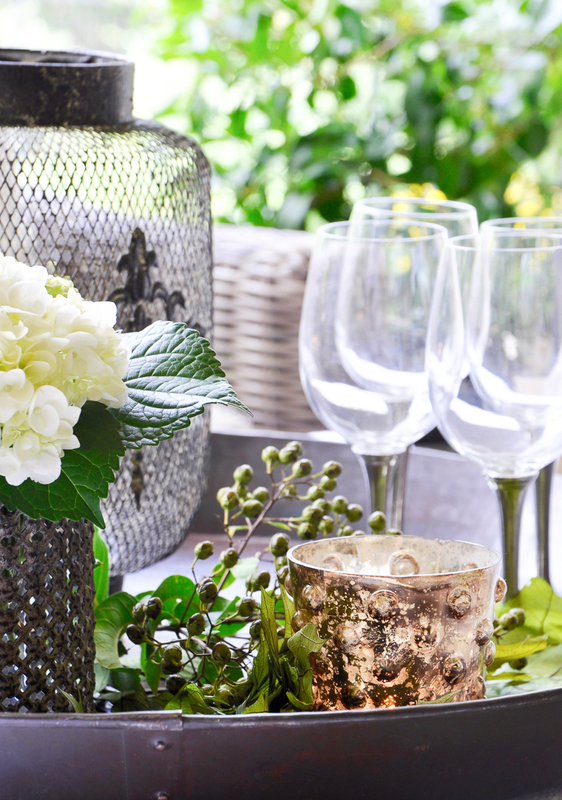 Don’t you just love the pewter stems on the wine glasses? So perfect for fall! You can read more about my glassware here. 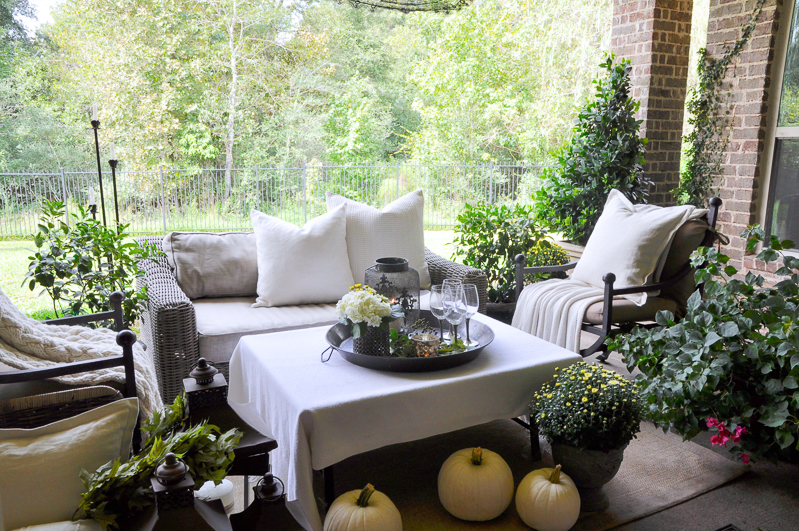 How do you transform your outdoor spaces with each season? I would love to learn what you do. Please feel free to share in the comments. 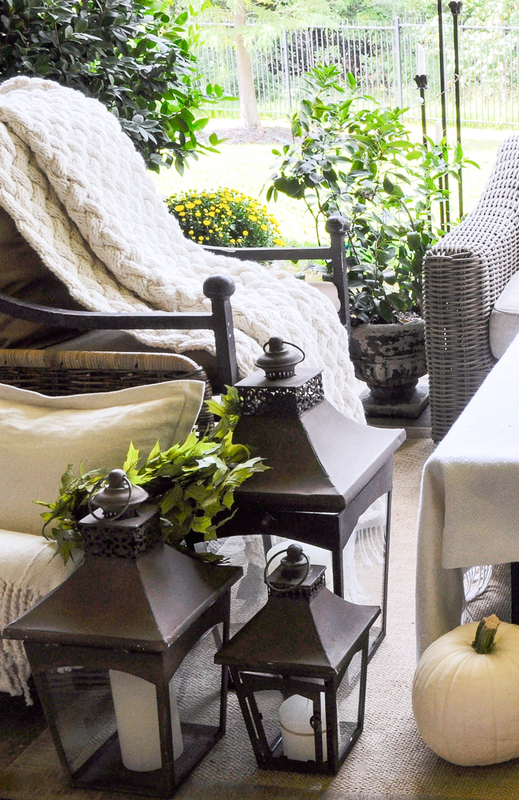 I’ve linked my other Fall Home Tours below for your convenience! Where did you buy the standards, holding the small candles, on the left of your foto? Thank you! I wish I could help you, but it’s a very old piece that I bought from a friend when she was moving. Thank you and you are too funny! Mine was looking a little rough a week ago….too hot to enjoy until fall! 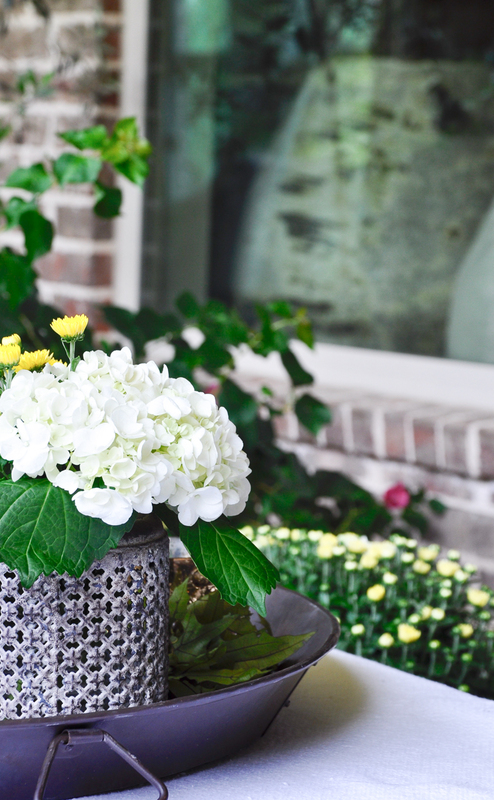 Love your patio i am stumped when it comes to planting flowers in pots which greens did you plant here? Hi Lisa! Thank you. 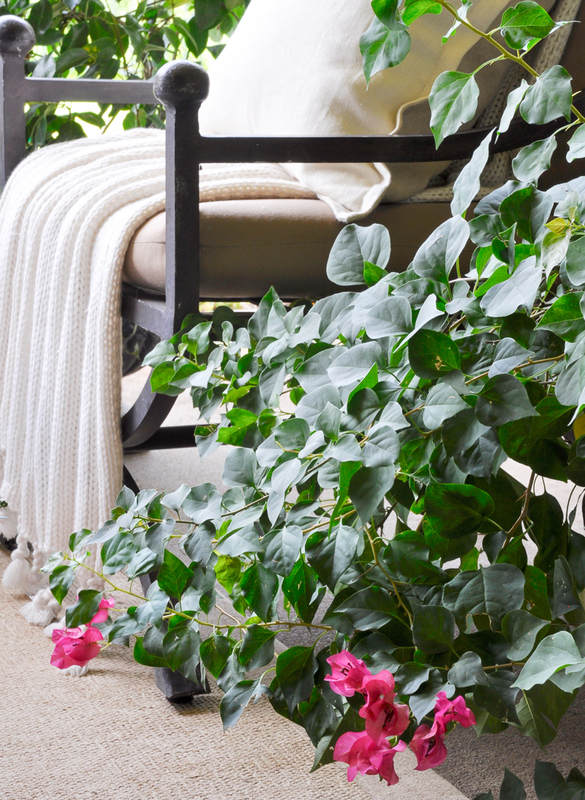 I planted mandevilla, mums, bougainvillea and the cone shaped trees are ligustrum topiaries. All do well in pots in Houston. Lol! Is Houston a sure thing yet? The north side is all forest land, so your odds are good! It’s my favorite thing about this area for sure! 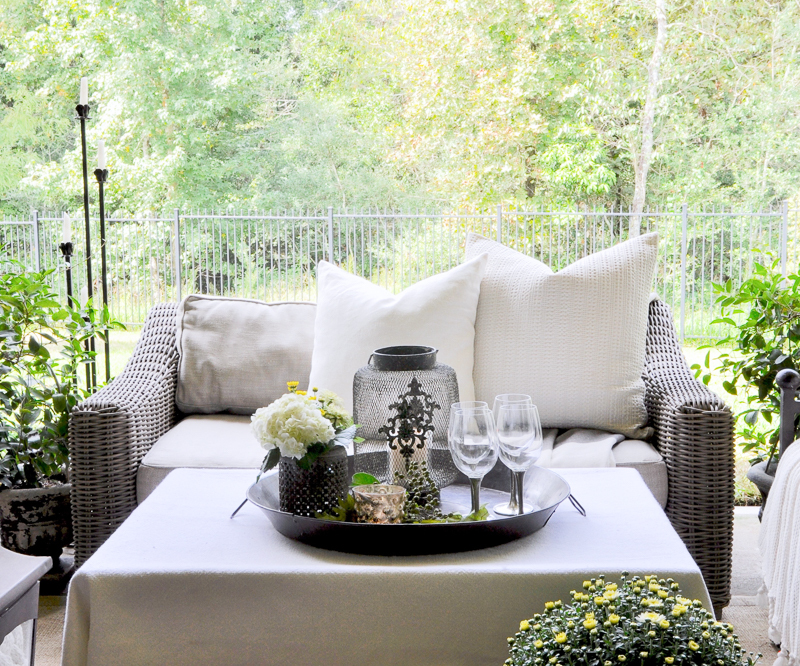 Looks like a great place for girlfriends to hang out, chat about the day and drink wine at the same time.. Just lovely. Thank you Mae! Yes to all of the above! What do you have on your table? 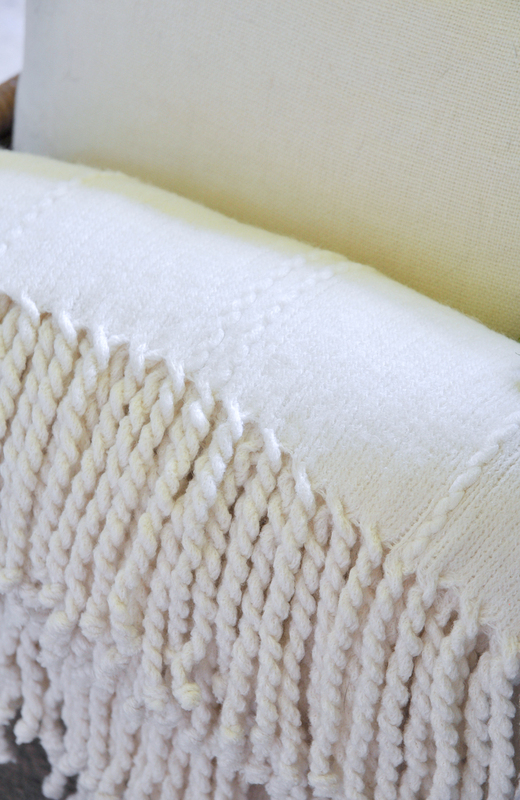 A blanket or table cloth? Which one and what color is it? It is a white linen table cloth. Hope this helps!